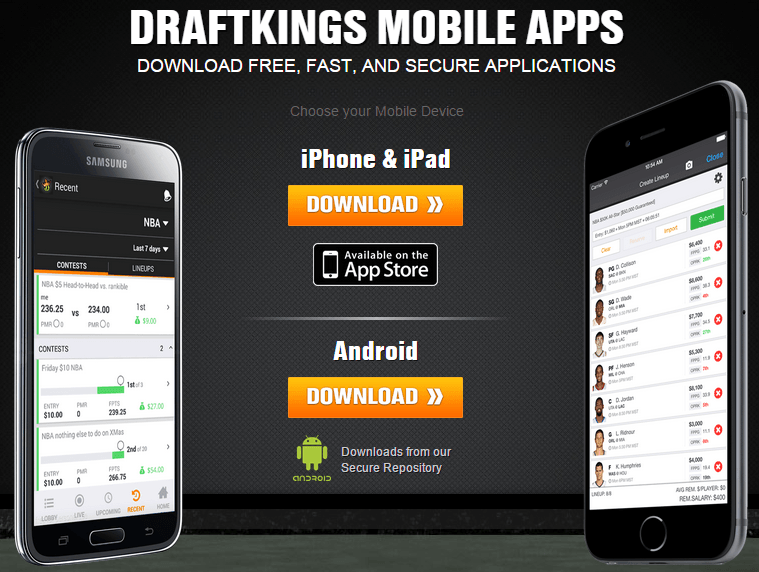 DraftKings provides free and easy to use mobile apps for the iPhone, iPad, and Android mobile devices. The iPhone/iPad apps can be downloaded from the Apple App store. 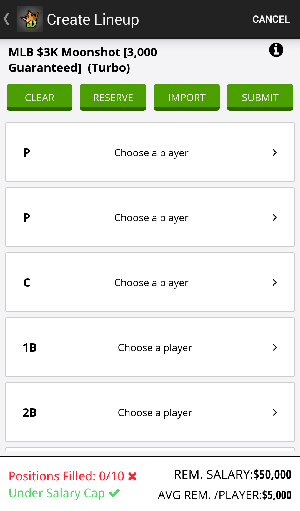 The Android app can be downloaded from the DraftKings.com website from either your computer or Android device. The Android app is also available in the Google play store. But first, you must register your new DraftKings account. Click here to visit the DraftKings website and open your account, it will take less than a minute. 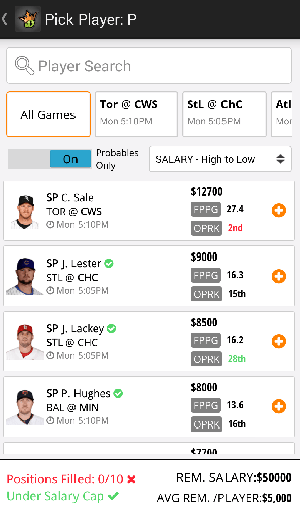 The DraftKings.com site is automatically configured for all mobile devices, and along with the app, both provide all the features available on the full site, in a very intuitive manner. Click here to review our full DraftKings Review page. 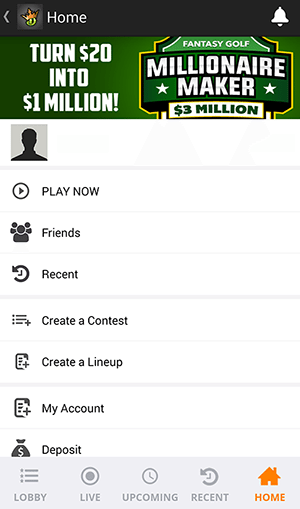 When installing the app, you will need to turn on location services so DraftKings can verify user eligibility*. 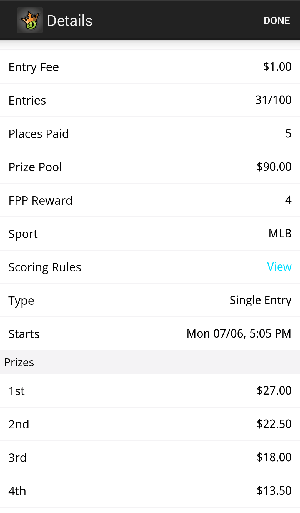 United Kingdom (U.K.) users with Android devices can download the app from DraftKings. You must be at least 18 to 21 years old (depending on which state) and be a legal resident of the United States or Canada to enter contests to win cash prizes, with some exceptions. To view the current list of DraftKings blocked states, click here. You may only have one account on DraftKings. If you reside in the United Kingdom (U.K.), you must be at least 18 years old. We will compare both the easy to use DraftKings.com mobile site and app features which allows you to do whatever you need to do on your mobile device. Click here to learn more about the DraftKings promo for new players. The DraftKings app home screen is the first screenshot to the left below and is the starting place to quickly access any of the features that the full web site offers. Simply drag down, right, or left to find whatever feature you may need. The home screen is the bottom right icon highlighted in orange. 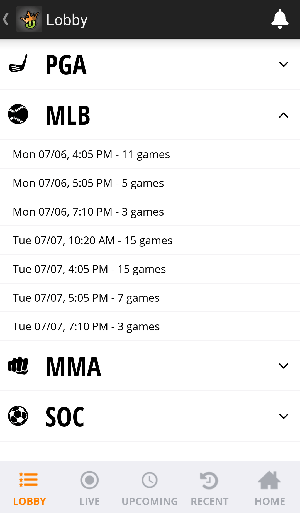 When accessing the lobby, as is shown in the middle screen below, only the sports in season will be available and listed here. Tap on your sport to select it, and then select your contest starting time. Keep up to date with live scoring on all your contests. All the contests for this sport and start time will then be listed for you to select from. Above the list of available contests, from left to right, you will see the filter option icon, contest types, and various sorting options, all to help narrow down what exactly your are looking for. 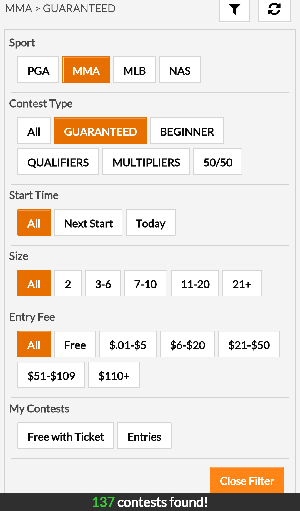 The filter icon, shown to the left below, gives you the option to filter your contest size and your entry fee range criteria. 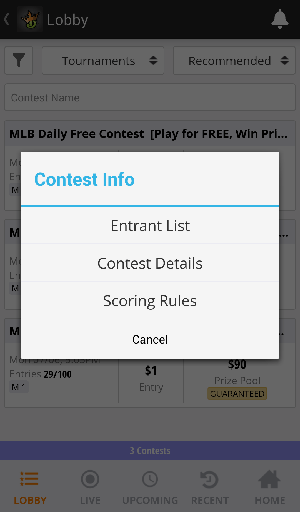 If you hold your finger down on a particular contest (instead of tapping it), the contest info screen will appear which can show you who your competitors are, scoring rules, and contest details, as shown on the right below. Once you have selected your contest, if have not done so already, you can create your lineup and pick your players. 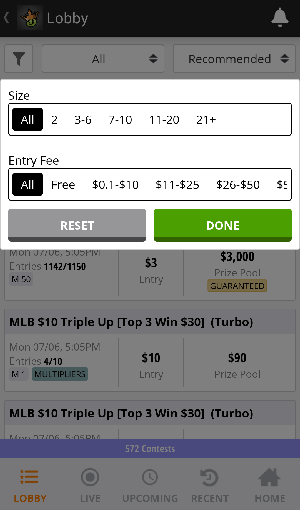 You can also create any lineups before selecting a contest from the home screen. 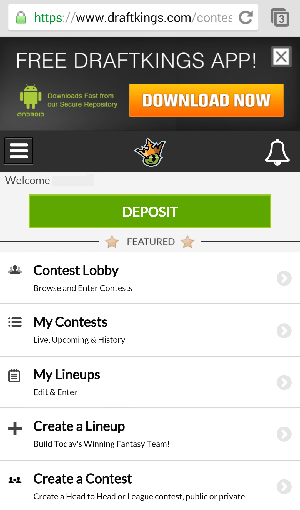 The DraftKings app is fast and simple to use and it is the recommended option when compared to the mobile site. The DraftKings.com mobile site works similar to the app. You can download the app from the mobile site home screen. This is recommended since the app just works faster. The DraftKings site home screen looks similar to the app version. The menu icon is to the left with the three horizontal bars. Touching this icon will bring up the full menu of features that are not listed on the site home screen. Once you select your sport and contest type (guaranteed, 50/50s, etc. ), you can tap the filter icon to the right which will give you the option to narrow down the list of contests you are interested in. Once you select your contest, create your lineup for it if you have not already done so, enter and get paid! 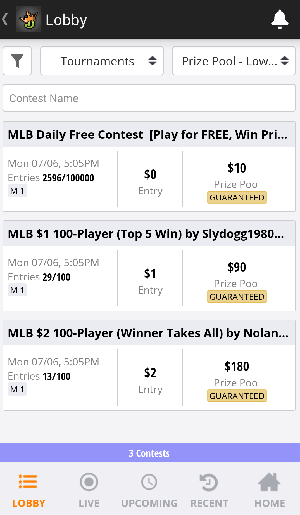 The DraftKings mobile site works just fine but their free app is the way to go. Good luck players!